Apple’s next generation iPhone will not be similar to the display like the previous devices and will sport an 18.5:9 aspect ratio like LG G6. 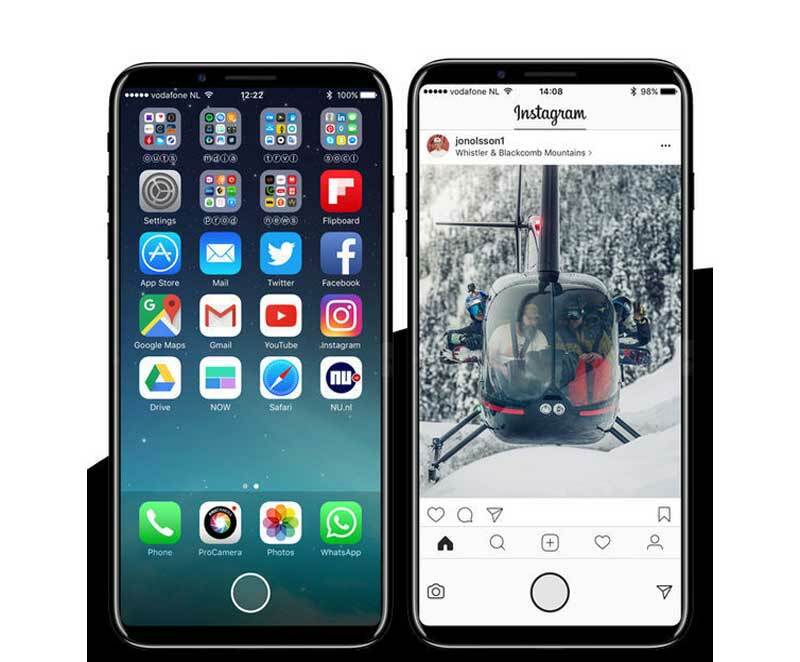 iPhone 8 is rumored to sport a bold new design featuring an OLED display without a bezel and the company may also move the fingerprint reader to the back of the phone. Apple will also bring ‘True Color iPad Pro’ screen technology to its Smartphone for the first time. This uses advanced four-channel ambient light sensors to automatically adapt the color and intensity of the display to match the light in one’s environment. The full spectral sensing ambient light sensor will be added to the iPhone 7S, iPhone 7S Plus and iPhone 8. Apple's AirPods were just the first move in the company's quest to rid the world of wires. Several sources, including Bloomberg, have reported that Apple is currently testing wireless charging tech, and that it could very likely appear in the next iPhone. Even better, the cutting-edge tech would allow devices to be recharged from far away even from across a room. Perhaps your rat's nest of white charging cables can be repurposed into an avant-garde centerpiece? The overwhelming majority of iPhone 8 speculators believe it will feature a massive redesign. Most notably, the screen will be "bent" on either side, much like those on the Samsung Galaxy S7 edge or Note7 (RIP). Furthermore, both the front and back sides could be covered in glass and connected via a metal frame, much like they were in the iPhone 4 and 4s models. Here's hoping the company manages to make it crack-proof this time. In an effort to increase screen size without actually increasing the size of the device, Apple's reportedly ditching the Home button as we know it. Removing it will allow Apple to get rid of the borders at the top and bottom of the screen and finally make way for a display that stretches the full length of the device. In its place, there will likely be a "virtual" home button positioned on the screen, along with a more advanced Touch ID featuring a fingerprint sensor that can read through several layers of the display, and a camera that's integrated into the display.